Troy, also known as Ilium, was a Phrgyian city on the Troad. Troy was a great city, wealthy and powerful, second to none on earth. It was situated in the plain, not far from the sea. Since it was situated near the Hellespont, it could control the route of trade between the Aegean and Black Sea, bringing enormous wealth to the city, as well as exerting influences upon its neighbours. It was the city to be destroyed by the dispute between three powerful goddesses. See Trojan War and Heroes II for detail about the war. Teucer (Τεὓκρος) was the son of the river-god Scamander and Idaea, a nymph of Mount Ida. He was the first king of Troad. Not much else is known about Teucer, except that he was the father of Bateia. Dardanus (Δάρδανος) was the son of Zeus and Electra, one of the Pleiades, daughter of the Titan Atlas and Pleione. Dardanus was also the brother of Iasion. They were living on the island of Samothrace. According to most myths, Iasion (Ἰασίων) became the lover of the goddess Demeter, who bore him a son Plutus. The goddess taught Iasion about agriculture. According to Apollodorus, however, Iasion had violated Demeter, so he was struck down by his father's thunderbolt. Grieving for his brother, Dardanus left Samothrace, and was welcomed by Teucer. Dardanus married Bateia, who bore Dardanus two sons, Ilus and Erichthonius. Dardanus moved to the slope of Mount Ida, where he founded the city of Dardania. It was said that when Dardanus died, Electra hid her face in her grief. This was to explain that of the seven stars of the Pleiades, Electra's star was the dimmest. Though, the usual myth, say that this dim star was called Merope, Electra's sister, because she was the only sister to mate with a mortal. Ilus (Ἴλος) became king, first, but he died young and childless, so his younger brother Erichthonius (Ἐριχθόνιος) succeeded him as king of Dardania. This Ilus should not be confused with Ilus (son of Tros) who later founded Ilium, which was often called Troy. Erichthonius had married Astyoche, daughter of the river-god Simöeis (Simoeis), and she bore him a son, who was named Tros. Erichthonius was said to be the richest ruler in the world, at that time, because he owned 3000 mares. Boreas, the god of the north wind, like the mares so much that he turned himself into a black stallion, mating with most of the mare. The Sack of Ilium was one of the poems in Epic Cycle. The Aeneid was possibly written by Virgil. Tros (Τρώς) succeeded his father Erichthonius to the throne. He gave his name to the land (Troad) and to the people living in the Troad (Trojans). Tros was married to Callirrhoë (Callirrhoe) and was the father of Ilus, Assarcacus and Ganymede. His son, Ganymede (Γανυμήδης) was so beautiful, that Zeus fell in love with the youth. Zeus transformed himself into the form of an eagle, and abducted the youth, carrying Ganymede to Olympus in his talon. Ganymede became the cupbearer in Olympus. Zeus gave Tros a couple of immortal horses and vines made of gold, to compensate for abduction of the king's son. The Dardanian people, was then divided into two separate groups, between his two other sons by Callirrhoë (Callirrhoe): Ilus and Assaracus. Assaracus succeeded his father and continued to rule at Dardania, near Mount Ida, while Ilus (Ἴλος) chose to move closer to the sea. Ilus took part in games held by an unnamed Phrygian king, where he won the wrestling match. His prize was fifty boys and fifty girls, as well as dappled cow. A seer told Ilus that he must follow the cow to where it lay down, and there, build his city. The cow rested on the Hill of Phrygian Ate. That night, Ilus prayed for a favourable sign from Zeus, asking if this was where he should build his city. The sign came in the wooden statuette, depicting either the goddess Athena or her late companion, Pallas, daughter of Triton. The statuette was called Palladium, and it fell out of heaven, and landed beside Ilus' tent. This Palladium would protect Troy from falling to the Greeks in the Trojan War, while the image remained in the city. With this sign, Ilus founded the city that he named Ilium, after himself. Ilium was, however, often called Troy, after his father. So the two brothers began to rule two separate houses in two different cities. On the Trojan line, Ilus, who was the founder and king of Troy, married Eurydice, and became the father Laomedon. As it was said before, his daughter Themiste married his nephew, Capys (of the Dardanian line). His son Laomedon succeeded Ilus. On the Dardanian line, Assaracus' son, Capys, married Themiste, daughter of Ilus and Eurydice. Capys became the father of Anchises. Anchises (Ἀγχίσης) was a lover of Aphrodite, who bore him a son and hero, Aeneas. Aphrodite warned Anchises not to reveal their relationship to anyone. But Anchises had forgotten her warning, when he became drunk one night. So Zeus struck Anchises with a thunderbolt, when he boasted of having slept with the love-goddess. He became a cripple, unable to walk. His son ruled Dardania in his place. Aeneas was brave warrior and a pious leader. At first, Aeneas did not take part of the Trojan War, until Achilles invaded his land. When Troy fell in the war, Aeneas was the only leader to survive. Different authors give different accounts to his life after the war. According to the Roman poet Virgil, in The Aeneid, Aeneas escaped captured with his father and son, and travelled to Latium, Italy. Anchises died in Eryx (Sicily), before they could reach Latium. Aeneas won the right to stay in Latium, when he became victor in the war against the Latins. See Aeneas or The Aeneid, for more detail about Aeneas' life. Of the two royal lines, those of Troy (Ilium) became more powerful than the older Dardanian line, under the rule of Laomedon, but there was only three generations of kings in Troy (compare to Dardania having eight kings). The Little Iliad from the Epic Cycle. Fabulae and Poetica Astronomica were works by Hyginus. Facts and Figures: Astronomy, see the constellations of Aquarius and the Eagle. Laomedon (Λαομέδον) was the son of Ilus, the founder of Troy, and of Eurydice. Laomedon became king of Ilium (Troy), after his father's death. The new king married Strymo, Placia or Leucippe. Whichever woman he married, he was the father of Podarces (Priam) and many other sons. He had at least one daughter, Hesione. His son Tithonus was abducted by Eos, goddess of dawn, and taken to Ethiopia or Syria. The goddess bore him a son Memnon. Laomedon was known as the king, for his arrogance and his impiety, and who refused to honors his promises. Poseidon and Apollo, possibly punished for rebelling against Zeus, had to work for one year for a mortal. The two gods disguised as builders, and they were hired to work alongside with a mortal, Aeacus, son of Zeus and Aegina, (father of Peleus and Telamon), to build the walls of Troy. Poseidon and Apollo wanted the vine of gold as payment for their work. Laomedon agreed. The walls built by Poseidon and Apollo were impregnable, while those built by Aeacus were not. The Scaean Gates were the main entrance to Troy; it was here that Paris (with Apollo's help) had mortally wounded Achilles. The other entrance was called the Dardan Gates or the Dardanian Gates. After the gods finished building the walls, Laomedon refused to pay their wages for their services. Apollo caused the plague within the city, while Poseidon sends a sea-monster to ravage the Trojan countryside. The seers told Laomedon, that land would be spare, if the king would sacrifice his daughter to the sea-monster. Chaining his daughter, Hesione, to a rock and waited for monster to arrive. Returning from performing the ninth labour (fetching the girdle of Hippolyte), Heracles stopped at Troy. Learning what was about to happen, Heracles wanted Laomedon's immortal horses in exchange for rescuing his daughter. Laomedon agreed. After killing the monster, Laomedon again refused to pay as he had promised. Angry at the Trojan king's betrayal on his promise, Heracles planned to return with an army, after he finished performing the twelve labours. Heracles raised an army in Tiryns, and the Argonaut hero, Telamon of Salamis, son of Aeacus, joined the hero. After capturing the city, Laomedon was killed, along with many of his sons, and Heracles gave Heisone to Telamon as concubine. Heracles allowed Hesione to ransomed one captive. Hesione ransomed her youngest and only surviving brother Podarces, offering her veil as ransom. Podarces became king of Troy, and changed his name to Priam, which means "Ransom". Priam was also Troy's last king. Fabulae was works by Hyginus. The Little Iliad was one of the works in the Epic Cycle. Being the only son of Laomedon to survive a war against Heracles, Priam (Πρίαμος) was ransomed by his sister Hesione, and he became the new king of Troy. Before the ransom, his name was Podarces. His first wife was Arisbe, daughter of Merops, king of Percote. They had a son, Aesacus, who was a gifted seer. Priam soon married Hecuba, daughter of Dymas, and gave Arisbe to Hyrtacos. With Hecuba, he became father of Hector, Paris, Cassandra, Helenus, Deïphobus, and many other children. Some say that he had as many as fifty children by Hecuba, but Apollodorus say that it was most likely children by some other women as well as Hecuba. Apollodorus only recorded Hecuba being mother of ten sons, one of them was said to be a son of Apollo: Troilus (Troilos). Hecuba was mother of four daughters. Before Paris was born, Hecuba had a vision, and the seer interpreted that vision, saying that Paris would one-day causes the destruction of Troy. Priam had his second son by Hecuba, exposed in the wild. During his early reign, Priam was ally of Mygdonians and fought against the Amazons. The Amazons later became his ally, when he purified Penthesileia for killing her sister in hunting trip. Penthesileia led the Amazons in the last year of the Trojan War, where she was killed at the hands of Achilles. Years later, Paris returned to Troy and was recognised. Their parents had forgotten the warning by the seer (possibly Aesacus) and welcome him home. When three goddesses asked Paris to judge and award the golden apple to the fairest goddess, he awarded the apple to goddess of love, Aphrodite. Aphrodite promised him the fairest woman in the world, Helen of Sparta. This would result in the outbreak of war between the Greeks and the Trojans. Priam would have return Helen, when Greek embassy demanded the return of Helen to her husband Menelaüs (Menelaus). But Paris prevailed upon his father to refuse. As a result the war lasted for ten years and all but one son would die in the war. His son, Helenus, also a seer, would be the only son to survive the war. Hecuba and all his daughters became enslaved to the Greek leaders. Neoptolemus, son of Achilles, would kill the aged king (Priam) on the last day of the war. See also the Trojan War. 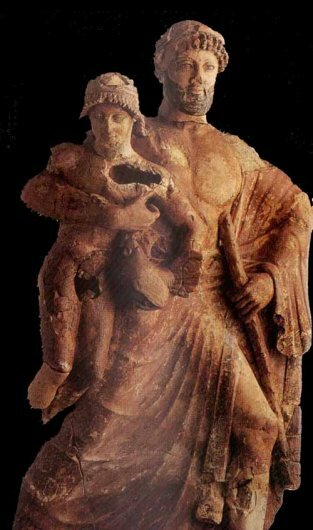 The Little Iliad, and the Sack of Ilium from the Epic Cycle. Nemean VII was written by Pindar. Laomedon, Hesione, Hecuba, Hector, Paris, Cassandra, Helenus, Deïphobus, Heracles, Penthesileia. First Created (House of Troy): 10/05/1999.